Giddy up! Netflix has renewed its animated BoJack Horseman TV show for a fifth season. Season fourth just dropped on September 8th. Raphael Bob-Waksberg created the series and executive produces with Steven A. Cohen and Noel Bright. Will Arnett and Aaron Paul also executive produce. Watch the season five renewal announcement, below. An adult comedy, BoJack Horseman centers on BoJack (Will Arnett). This middle-aged horse was once a big star, but now he’s washed up and aiming for a comeback. Aaron Paul and Amy Sedaris also star. The Netflix voice cast includes Alison Brie, Paul F. Tomkins, Adam Conover, Raphael Bob-Waksberg, Kristen Schaal, Angela Bassett, Patton Oswalt, Maria Bamford, Keith Olbermann, Stanley Tucci, and J.K. Simmons. Check out this Netflix press release for more. BoJack Horseman was created by Raphael Bob-Waksberg. The series is executive produced by Raphael Bob-Waksberg, Steven A. Cohen and Noel Bright. Will Arnett (Flaked, Arrested Development) and Aaron Paul (Breaking Bad) also serve as executive producers. 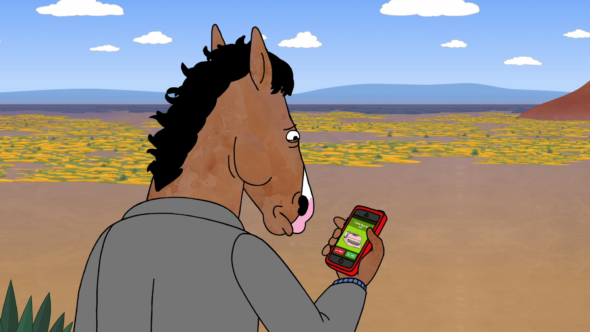 BoJack was designed by graphic artist Lisa Hanawalt and animated by LA-based ShadowMachine. The show is a Tornante Production, brought to life by Michael Eisner’s The Tornante Company. Bam boom, BoJack Horseman season four synopsis, here we go. Okay, so this season is full of all the things people love about their favorite depressed talking horse. First of all, you’ve got BoJack himself, who is up to his old tricks. Then you have Princess Carolyn, who is one cool cat. While Princess Carolyn toys with the idea of starting a family, BoJack has family issues of his own. This season, on BoJack Horseman. Meanwhile, Diane and Mr. Peanutbutter have family issues of their own. You might say their marriage is “in a pit,” if you know what I mean (which you won’t, until you watch the season). Meanwhile Todd has issues of his own — as he explores his own evolving sexual identity and also in some episodes doesn’t do that. Oh! And Mr. Peanutbutter’s running for governor now; I forgot to mention that, that’s important. Also, in one episode BoJack wears a new hat! Bet you want to tune in to see that new hat, huh? Okay, I lied, there’s no new hat. I just really want you to watch the new season of BoJack Horseman! What do you think? Are you still watching the BoJack Horseman TV series? How many seasons do you think it could run on Netflix? More about: BoJack Horseman, BoJack Horseman: canceled or renewed?, Netflix TV shows: canceled or renewed?